Every summer, forest fires make the news. While some happen because of natural causes, plenty could have been avoided through simple precautions from individuals and communities, whether homeowners, self-builders or BBQ lovers. 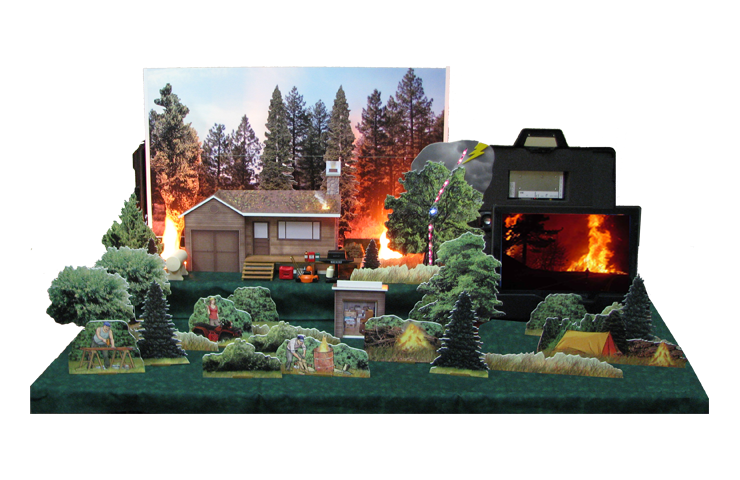 Used by State Forestry Departments all across the United States, the Wildfire fire safety simulator packs everything you need for a riveting presentation to small groups of people into a single briefcase. 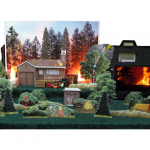 Wow children and grown-ups alike with realistic special effects, and using flip illustrations, show how the proper home site selection, defensible space measures and the right choice of building materials can all help improve structural ignitability and prevent damage from forest fires. At barely 36 lbs (17 kg), the Wildfire fire safety simulator can then be packed up and rolled to your next presentation! Portable, compact and light: barely 36 lbs!